On February 20, 2008, sky gazers from the central Pacific to Africa saw the full Moon turn a striking red as it passed into Earth’s shadow. From space, the lunar eclipse deepened the darkness of the night. 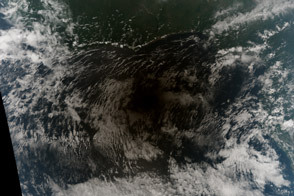 The Defense Meteorological Satellite Program’s (DMSP) F16 satellite captured this view of the eclipse as the satellite flew over the nighttime side of the Earth in a series of overpasses. The earliest overpasses are on the right, where bright light from the full moon reflects off clouds over the Atlantic Ocean and the east coasts of North and South America. The Moon entered Earth’s shadow at 7:43 p.m. CST (8:43 p.m. EST) while the satellite was over the central United States, right of center. The Moon was not yet completely eclipsed, so a dim light illuminates the clouds. In the growing darkness, city lights pop out of the landscape. The total eclipse began at 10:01 p.m. EST and ended at 10:51 p.m. EST, during which time the satellite was over the western United States. Though it was only about 7:30 p.m. local time, the darkness is complete. Without any reflected light from the Moon, clouds are invisible. Only city lights shine through the darkness of the eclipse. The eclipse ended at 12:09 a.m. EST, in time for the satellite’s next nighttime overpass over the Pacific Ocean. Clouds are again bright in the full light of the Moon. A total lunar eclipse occurs when the Moon passes through the center of Earth’s shadow. Some light scatters through Earth’s atmosphere, and it is this light that colors the Moon red during a total eclipse. Image and data processing by NOAA’s National Geophysical Data Center, Earth Observation Group, Boulder, CO. DMSP data collected by U.S. Air Force Weather Agency. Caption by Holli Riebeek. On February 20, 2008, sky gazers from the central Pacific to Africa saw the full Moon turn a striking red as it passed into Earth’s shadow. From space, the lunar eclipse deepened the darkness of the night. 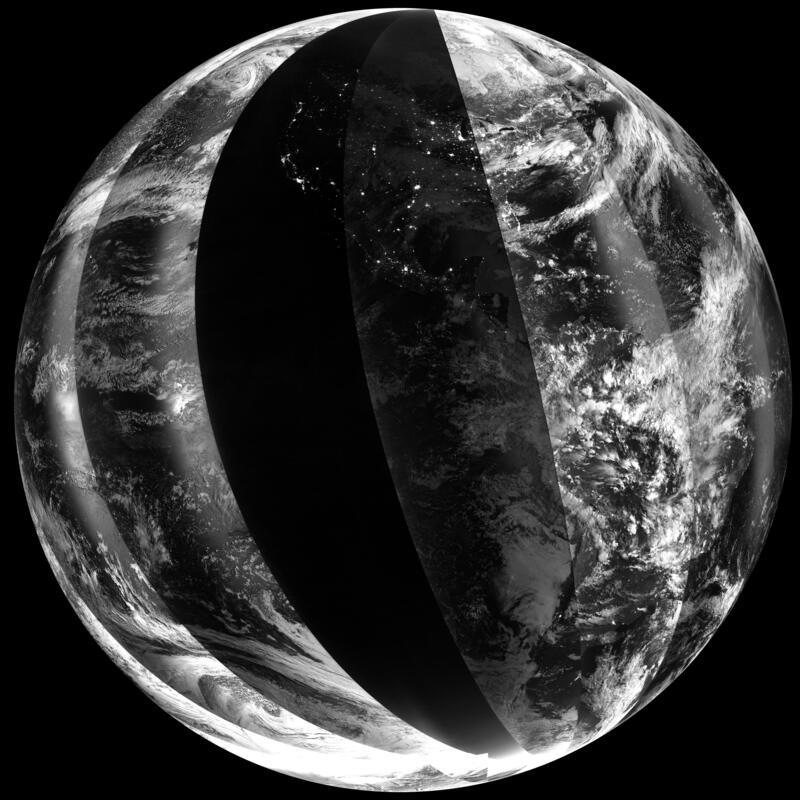 The Defense Meteorological Satellite Program’s (DMSP) F16 satellite captured this view of the eclipse as the satellite flew over the nighttime side of the Earth in a series of overpasses. Espenak, F. (2008, February 1). Lunar eclipses for beginners. MrEclipse.com. Accessed March 12, 2008. NASA. (2008, February 13). Total Lunar Eclipse Science@NASA. Accessed March 12, 2008.